This set includes a variety of Elapsed Time problems. Students will have the opportunity to use word problems, charts, and clocks to answer their elapsed time questions. Students will determine when specific situations start or finish and how much time is in between. There are 4 TASK cards per page and there are a total of 52 TASK cards so that your students can review important math concepts while having fun at the same time. This set includes 4 student answer Sheets and 4 teacher answer keys. 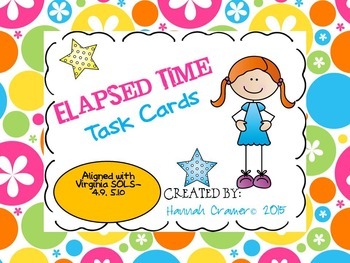 Task Cards can be used for daily reviews, centers, games, small group instruction, SCOOTs, and even early finishers. The possibilities are endless! Be creative and have fun!